Our t-shirt quilt company takes care to provide a high-quality finished product at a fair price. All materials, except your T-Shirts, are included in the price. The base price for a Sashed Quilt is $18.00 per T-Shirt square. If you would like the extra inner border like the one pictured in the firefighter quilt, there is an extra charge of $20.00 and the quilt will be slightly larger. 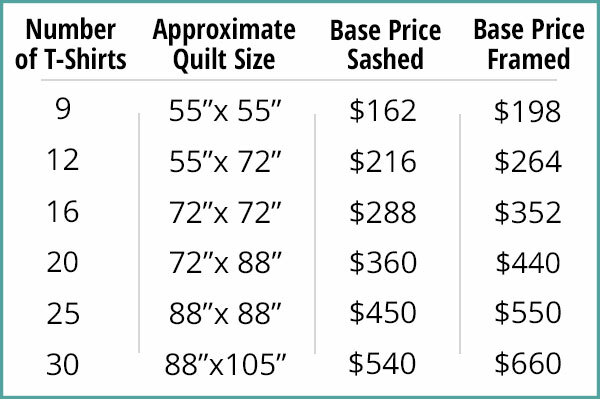 The base price per T-Shirt square for a Framed Quilt is $22.00. There is an extra $10.00 charge per square for combining pieces from different shirts to make one square or if any extra piecing is required to make the T-Shirt big enough. Squares will finish out at 14 1/2″, so if your design is bigger, part of it will be cut off. Shipping of your shirt quilt will be via FedEx and will be $25 to $30** per quilt depending on the size of the quilt and your location. Sales tax is added for all quilts shipped to any location in Texas. A $100 down payment is required and can be made by check*, money order or online through PayPal. Or you can call me with your credit card number. When your T-Shirt quilt is completed, I will email you requesting the final balance including the shipping charge. If you pay by check, allow 10 days for the check to clear before I ship your T-Shirt quilt. If you use Paypal or a credit card, I can ship your quilt sooner. If you live in the Houston area and would like to bring your T-Shirts, please contact me to schedule an appointment. Our t-shirt quilt makers are happy to see you in the studio to work out the quilt details. Otherwise, please go to the Order Form page and follow the instructions for shipping your T-Shirts. * Checks should be payable to “Sharon Dixon”. ** $25-$30 Shipping is for the contiguous United States. I am so happy with them!!! Just wanted to say the quilts are beautiful!! I am so happy with them!!! Thank you so much!!! I LOVE the quilt! It’s perfect! Thank you!! I love it! Thanks again! The quilt arrived yesterday. I love it. Thanks again! I posted a picture on Facebook and it got over 125 likes.